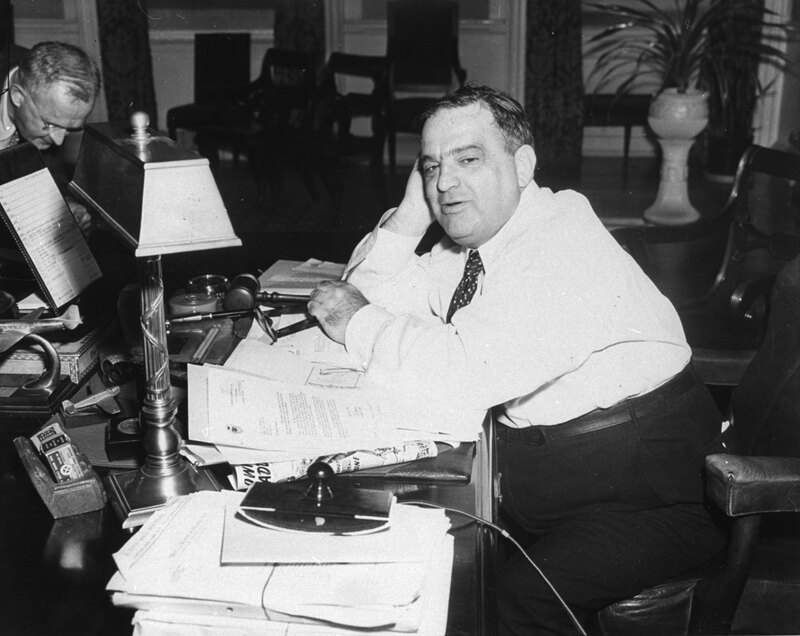 Fiorello La Guardia also took office in a time of crisis—and he was open to new ideas and bold reforms. A great metropolis holds its breath. Denounced during the campaign for his radical past, the newly elected mayor is quickly embraced by the mainstream press, who now search his every gesture for signs of moderation—and make much play of his ethnically diverse family. Liberals and progressives, who still have trouble believing that one of their own actually won, remain torn between celebration and the fear of an imminent—some say inevitable—betrayal. Meanwhile, the city’s poor and desperate, who voted for the new mayor in overwhelming numbers, wonder whether a campaign that promised so much will make any difference to their lives. This was New York City on January 1, 1934, when Fiorello La Guardia, a half-Italian, half-Jewish Republican who fought for labor unions, defended the rights of immigrants and opposed American intervention in Nicaragua, took the oath of office. La Guardia went on to become the greatest mayor in New York’s history, leaving behind a legacy of public parks, public housing and public works unrivaled by any of his successors, as well as a reputation for personal honesty and administrative competence that even the outgoing mayor might envy. Indeed, La Guardia’s accomplishments pose a daunting challenge for any of his successors, who, whatever their other achievements, have been uniformly successful in their struggle to lower expectations. “After eight years of charisma, and four years of the clubhouse, why not try competence?” asked Ed Koch, whose racially divisive, scandal-racked administration led to David Dinkins and Rudy Giuliani and Mike Bloomberg. Yet even La Guardia couldn’t solve all of New York’s problems. One of them, the widening gap between rich and poor, became the centerpiece of Bill de Blasio’s recent campaign. “My job is to help New Yorkers live in New York,” he said. Eighty years earlier, in What’s the Matter With New York, Norman Thomas and Paul Blanshard worried that “the very men who make the city, who clean its streets and shovel its coal and run its subway trains, may be exiled from it when they quit work at night. Today in New York the average worker simply cannot provide a decent home for himself on the average wage.” Thomas was the leader of the Socialist Party; Blanshard, an ordained Congregational minister, was a muckraking journalist who served briefly as associate editor of this magazine. Their 1932 anatomy of the city’s ills was meant as both diagnosis and treatment plan for an incoming reform administration. The book’s vision of the city’s future was unabashedly radical: “We are socialists, eager to make New York an example of effective municipal socialism,” they wrote, explaining that cities had “become the frontier of the struggle between organized capital and the forces of social change.” Though it seems farfetched today, socialist mayors once governed American cities as disparate as Bridgeport, Milwaukee, Reading and Schenectady. Dubbed “sewer socialism” by its detractors, and derided by Lenin “because it dreams of social peace, of class conciliation, and seeks to divert public attention away from the fundamental questions of the economic system as a whole,” municipal socialism offered little of the revolutionary excitement or intellectual prestige of Bolshevism. As Thomas and Blanshard ruefully observed, “a man who discusses intelligently the color line in South Africa and the freedom of India will consider a street-car franchise in Brooklyn beneath his mental range, and he will be positively disgraced if anyone asks him to run for alderman.” Yet to read their book today is to realize how much even de Blasio’s campaign promises take for granted the diminished sense of the possible that he—and we—inherited from his predecessors. They make no apology, however, for proposing reforms: “Properly to arouse New York requires the inspiration of a great challenge and a great ideal, but that ideal cannot be put on ice or otherwise conserved for one great revolutionary moment.” To the contemporary reader, the period charm of such rhetoric may be less striking than the recognition of just how many of the reforms these socialists proposed—from municipal ownership of the city’s subway and bus lines to government reorganization to holding criminal arraignments at night (as a safeguard against the then-common practice of police extracting “confessions” via the third degree) to the conversion of Roosevelt Island (then named Welfare Island) into a public park—have since come to pass. Indeed, many of them were set in motion by the new mayor. Breaking with that presumption, the book’s contributors propose a raft of programs in education, the arts, housing, and immigration and labor policy—along with some smart, innovative ways to raise the money to pay for them, such as ending subsidies for luxury development and spurious job retention while offering tax credits to firms that actually hire graduates of the city’s vocational training programs. Or using city-owned land as a lever to encourage the growth of the kind of industrial jobs that offer an entry point into the middle class. The chapter by Laura Wolf-Powers on how to get out of the “parallel universe” of an economy that produces only high-wage jobs for the well-educated and low-wage service jobs for the rest is particularly worth reading. Good ideas can come from anywhere. Mayor Bloomberg’s experience in the corporate world gave him an appreciation for the use of data to monitor and improve performance. As Megan Golden and Liana Downey write, “Measuring and tracking outcomes can confer real benefits on residents”—not least the knowledge, particularly important during economically straitened times, that taxpayers’ money is being well spent. What Bloomberg either never had, or lost en route to making his fortune, was an ability to understand what life is like for those to whom paid sick leave and a living wage are not abstract counters in some grand bargain, but the necessary prerequisites for a decent life. For all his making nice to Wall Street, de Blasio seems to get that, and to understand that empathy alone will not lift anyone out of poverty. What lessons can he—and we—learn from New York’s previous experience with a radical administration? First, that he has to raise his sights. When La Guardia took office, the city’s unemployment rate was roughly 25 percent; today the figure is less than 9 percent. And both the city and the country are far wealthier now than in the 1930s. Indeed, the amount of sheer wealth on display in New York today—in shop windows, on restaurant menus, and on the backs of the men and women who throng the city’s clean, safe streets—makes it obvious that for many New Yorkers, these are indeed the best of times. So if the money is out there, how can the city capture it? The new mayor’s signature proposal to tax incomes above $500,000 to pay for universal pre-kindergarten will require Albany’s permission. So will many other progressive measures, such as ending the current property tax system’s tilt in favor of the minority of New Yorkers who own their homes, and a further bias that allows wealthy co-op and condo owners to pay less tax than rental landlords, who in turn pass that extra cost on to tenants. Or raising the minimum wage. Instead of using this as an excuse for inaction, the new mayor should seize the opportunity—and the undoubted influence he has over the 2014 gubernatorial campaign—to press hard for a speedy renegotiation of the home-rule provisions that prevent the city from managing its own affairs. High on his list should be reinstating the commuter tax, which brought in $300 million annually until a law abolishing it was passed in 1999 by the state legislature and signed by then-Governor George Pataki, who defeated the current governor’s father. Andrew Cuomo showed political skill as well as courage in the fight for gay marriage, but if the equity argument doesn’t move him, perhaps revenge will. And while the new mayor is making his travel plans, he can’t forget Washington. Although Roosevelt endorsed his opponent during the campaign, few of La Guardia’s achievements would have been possible without the president’s backing—or the New Deal funding he directed to New York. “I am in the position of an artist or a sculptor,” La Guardia told a reporter, “who…hasn’t a chisel or a brush.” Now, as then, the federal government has the biggest set of brushes around. Roosevelt wanted New York to serve as a model of what government can accomplish—in housing, public health, transportation and recreation. De Blasio could offer Obama the chance to redeem his progressive rhetoric—and to be remembered for enabling an urban renaissance, rather than merely being an onlooker at the bankruptcy. Finally, de Blasio must realize that the market—especially the real estate market—will fail him just as it failed La Guardia, and Koch, and Bloomberg. “It is not enough to simply build more market rate housing in hopes of…supplying more than the demand,” write the authors of the housing chapter of Toward a 21st Century City for All. From 2000 to 2010, New York’s housing supply grew at more than twice the rate of the city’s population. “If we could build our way out of our affordability crisis…[costs and rents] should have gone down.” Yet as the authors point out, they did not. From the days of Henry George in the nineteenth century, New York’s progressive politicians have tried to recapture the vast—and totally unearned—income created by the rise in land values. But none have succeeded: even today, when projects like the Hudson Yards and the No. 7 subway extension prompt huge increases in values, only a tiny portion ends up in the city’s coffers. In the decades after the fiscal crisis of the 1970s, New York’s rulers hid behind the myth that businesses—and their owners—had to be bribed to remain in the city. Even in the 1930s, some argued that “the necessity for concentration which created the great city in the first place is now being destroyed by the telephone, the telegraph, the radio”—all enterprises that, like the Internet, have actually spurred new growth. The only way for de Blasio to keep his campaign promises is to expand the public sphere—deliberately and competently, but relentlessly. Not just in housing and transportation (where de Blasio backed the long-overdue Cross Harbor Freight Tunnel), but in entirely new areas like Internet access, bail bonding (a reform proposed by Thomas and Blanshard), green construction and maintenance. He might also consider bringing back the “birch rod”—a New Deal idea for spurring competition in faulty markets by encouraging publicly owned enterprises. FDR took a birch rod to utility companies that refused to lower their rates; Ed Koch used a similar measure to break the concrete cartel. Such baby steps will not usher in the millennium. Still, the Reagan-era assumption of “private sector good, public sector bad” probably needs to be revised when an out-and-proud socialist like Kshama Sawant can win election to the Seattle City Council—and when an AMA (Ask Me Anything) session with Bernie Sanders tops Reddit. The new administration will need audacity—and competence. But it will also need to keep listening to the voters, who were offered more of the same in the Democratic primary and chose instead the candidate promising “a dramatic change of direction,” an end to the “gilded city where the privileged few prosper, and millions…struggle each and every day to keep their heads above water.” Unlike Barack Obama, Bill de Blasio has set out clear benchmarks: on affordable housing, workers’ rights, police abuse, the environment and education. It’s up to us to make sure he reaches them.